Eye: Amber gold with flashes of mahogany. Nose: Floral notes going to dry fruity notes of orange, grape and apricot. Palate: Well balanced with the delicate aromas from the oak casks bringing out the characteristics of an old Grande Champagne Cognac that has been distilled on the lees. 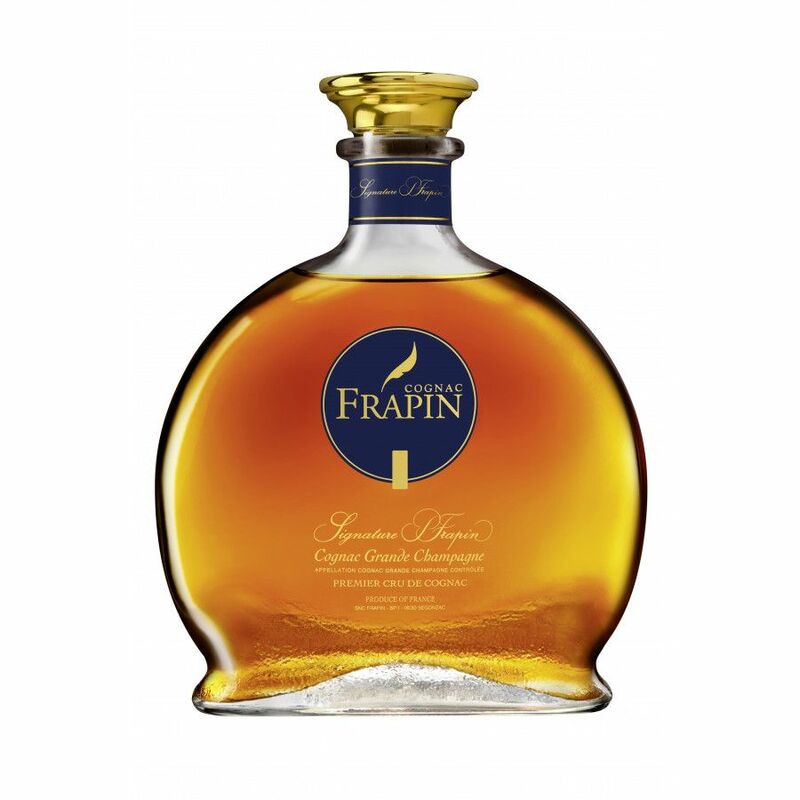 The Grande Champagne delight that is the Frapin Signature Cognac is a great choice if you’re looking for a versatile, quality Cognac that will complement any drinks cabinet. Napoleon in age quality, this premier cru offering has been produced from eaux-de-vie grown in Frapin’s own vineyards. With knowledge of the vine and the damp cellar having been passed down the family over 20 generations since 1270, you can sure that any Frapin Cognac has been produced with a true wealth of experience. For anyone who enjoys a complex, fruity blend, then this Cognac will certainly hit the spot. The flavors evolve as the Cognac takes you on a journey. First, enjoy the fleshy, floral notes that then give way to a melange of delightful fruity tones such as grape. The Signature Cognac by Frapin is presented in a stylish decanter to show off its glorious color - this is definitely one to keep on display. What is it about the Grande Champagne that produces such high quality and refined Cognac? The ‘Premier Cru’ of the region is renowned for its unique soil composition, that has been formed over millions of years. Years of fossilization and marine deposits have created a fine soil that is high in chalk content. This makes for fine Cognac that has a long finish - what everyone wants to experience in an exceptional Cognac. This is exactly what the Frapin Signature Cognac delivers. Located in the Château Fontpinot in the Grande Champagne, this Cognac house are the only one in the cru that can genuinely be called ‘Chateau’. Their methodology is proven through years of heritage. To create the Signature Cognac, they harvest Ugni Blanc grapes in their 240 hectares. The juice of the grapes is fermented to release the aromatic qualities ready for maturation. Distillation on the lees gives the Cognac its unique flavor, in one of their six copper stills. Distilled once, and then twice in the ‘bonne chauffe’ lees, the spirit is created. The spirit is then moved to Limousin oak barrels to begin the ageing process. The tannins are released, and they are moved to the second lot of casks, known as the ‘roux’. Eaux-de-vie from the Grande Champagne need time to mature and truly express themselves, hence the long time spent in the oak casks. Visit our blog to see the time that we visited the Frapin estate. 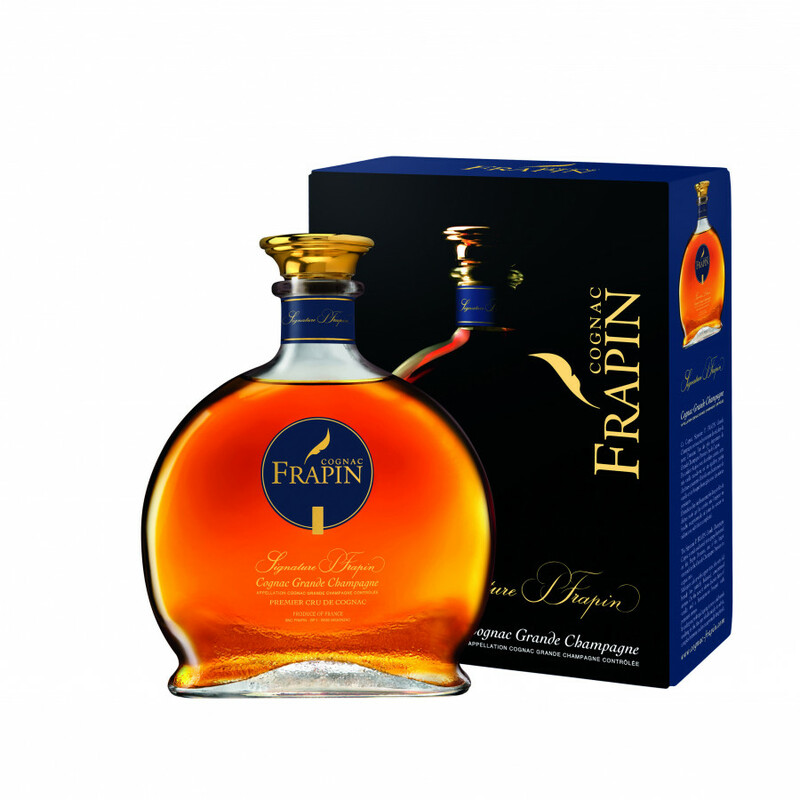 This Grande Champagne Frapin Cognac goes well on ice, neat and with food pairing. The dry, fruity quality makes it a wonderfully delicate accompaniment. It arrives in a wonderful spherical decanter, with a elegant dark blue and gold top.